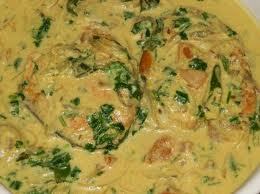 Fish Molly is an excellent dish from the cuisine of Kerala state in India. It's a very popular and pleasant dish where fish is cooked in coconut milk along with spices giving a subtle taste, lightly spiced stew based dish. There are many variations of making the fish molly. Fish or meen as it is commonly called in Malayalam is the staple dish in Kerala. It has a long coastline with a strong fishing industry that is reflected in their cuisine and the variety of fish recipes that originated here. Coconut is one of the main ingredients in making of fish molly or any dish cooked in Kerala style. Coconut in any form is prominently featured in their traditional dishes as coconuts grow in abundance in Kerala. Usually most of the dishes are cooked in coconut oil giving a unique taste by itself. Clean the fish and cut into 1 inch pieces. Crush the red chili with garlic and keep aside. Slice the onion thinly. Cut the green chilly lengthwise. Chop the ginger. Put the oil in a cooking pan and sauté the onion and green chilies for five minutes. Then add the crushed pepper, garlic and ginger. Fry for 3 minutes until the smell of chili comes out. Add the coconut milk, turmeric powder and let it boil. Then add the fish and salt. Cook well and add the tomato pieces. Cook for 5 minutes. Add the lemon juice and curry leaves.